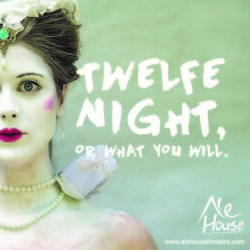 Toronto Fringe: A most delightful production of Twelfe Night, or what you will from Ale House Theatre Co. Finally got to see Ale House Theatre Co. do Shakespeare yesterday. They’re running an Original Practices version of Twelfe Night, or what you will, directed by Joshua Stodart, at St. Vladimir’s Theatre during Toronto Fringe. An Original Practices production uses the stage conventions and tech that were known to be used in Shakespeare’s time – and this dictates the staging and tone of the play. This production of Twelfe Night features some hilarious physical comedy and characterizations, and keeps the pacing light and quick – which keeps the pranking schemes from getting too mean-spirited, and the sudden decisions about love and marriage from looking too crazy. All nicely book-ended with Feste, who plays recorder at the top of the show (he’ll take period-appropriate requests) and sings at the close. Stodart has assembled a fine cast for this tale of tragically separated twins, disguise, crazy love and mistaken identity. Stand-outs include Peyton Le Barr, who brings an adorably puckish yet vulnerable quality to Viola; Hilary McCormack (doing double duty this Fringe, also performing in Hanger, directed by Stodart) is striking as the lovely and proud Olivia, her stubborn resolve to cloister herself away melting into a puddle as she falls crazy stupid in love with Cesario (Viola in disguise); Andrea Massoud is wonderful as the saucy and cunning Maria – and she has excellent chemistry with Tim MacLean’s drunken sot of an aging party boy Sir Toby Belch and Matt Shaw’s hilariously awkward twerp of a Sir Andrew Aguecheek. Tal Shulman does an excellent turn as Olivia’s arrogant and snobbish steward Malvolio, who turns to a silly pile of mush himself at the prospect of being adored by his mistress. And Jake Vanderham charms as the sharp-witted, good-natured Fool Feste, entertaining us on the recorder and with a lovely set of pipes of his own. All in all, a most delightful production of Twelfe Night, or what you will from Ale House Theatre Co. Get yourself out to see some excellent good fun Shakespeare. Twelfe Night, or what you will continues at St. Vladimir’s until July 12 – check here for exact dates/times. In the meantime, give Ale House Theatre Co. a follow on Twitter to keep up with future productions. Author life with more cowbellPosted on July 6, 2015 July 6, 2015 Categories TheatreTags Ale House Theatre Co., Andrea Massoud, Hanger, Hilary McCormack, Jake Vanderham, Joshua Stodart, Matt Shaw, Original Practices, Peyton Le Barr, St. Vladimir's Theatre, Tal Shulman, Tim MacLean, Toronto Fringe, Twelfe Night or what you will, William Shakespeare1 Comment on Toronto Fringe: A most delightful production of Twelfe Night, or what you will from Ale House Theatre Co.